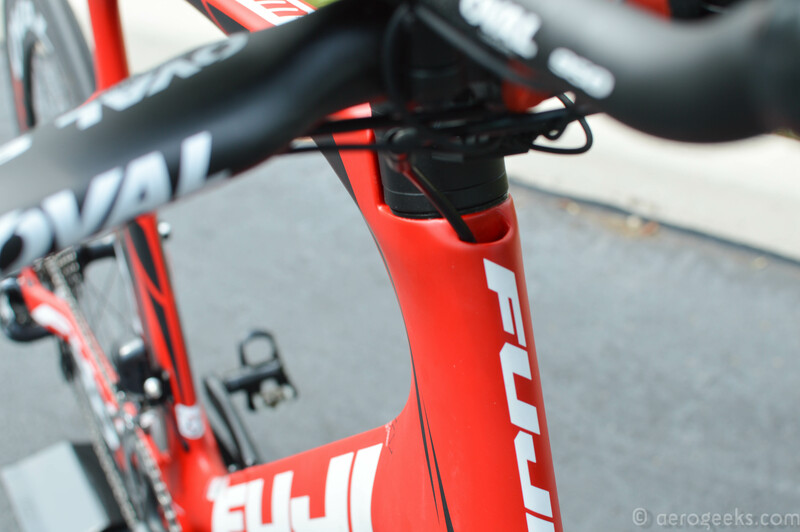 When we first unboxed our matte red 2014 Fuji Norcom Straight 1.3, we expected that we would be spending the next few months talking about how easy it was to fit. And really, who could fault us? After all, when a bike’s tagline is “Fit Comes First,” you expect it to be all about fit. And yet that’s not what we’d start with if we were asked to describe the Norcom Straight. Instead, if we had to sum this bike up in just one single word, it would simply be “fast.” And that’s not just based on our ride impressions–though the fact that our NS1.3 held the top spot on both of our main Strava segments was pretty convincing evidence as well. The really overwhelming evidence came to us during Stage 20 of this year’s Tour de France. 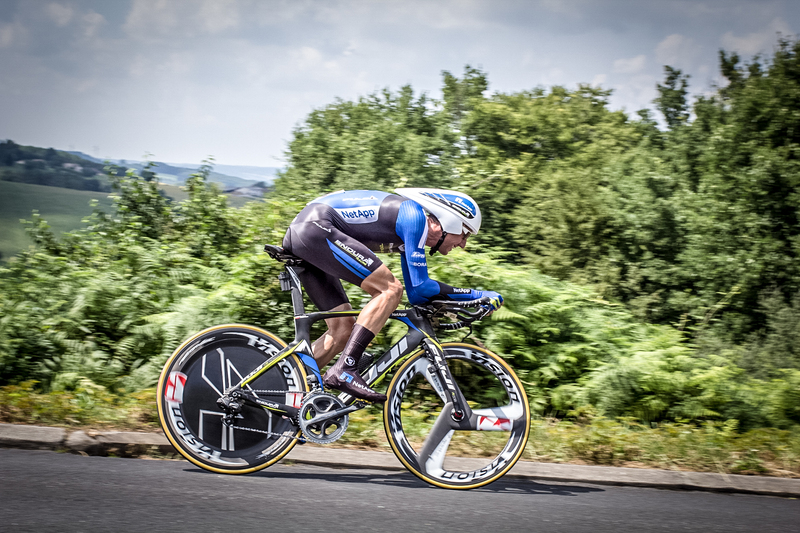 For those among us who weren’t glued to their TVs this July, this was the one and only Time Trial of this year’s tour. 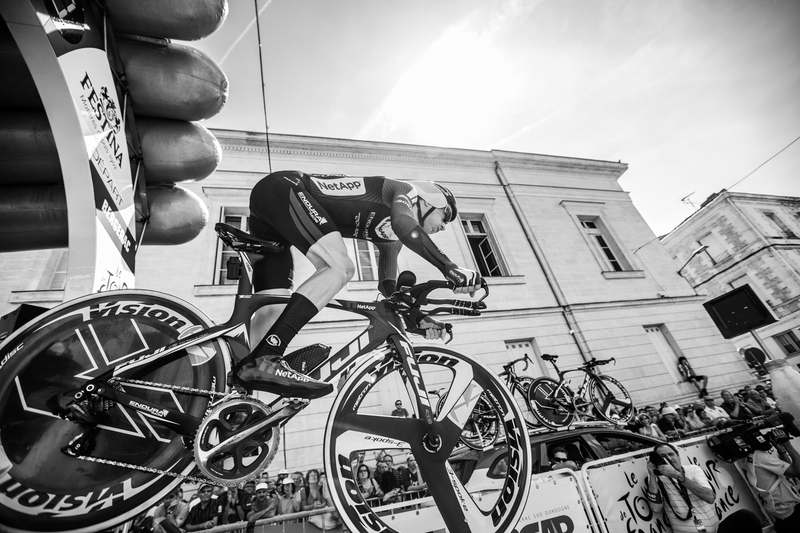 Riding Norcom Straights, Netapp-Endura had two riders land among the top five. That performance also won them the day’s team classification above BMC, Trek Factory Racing, and Omega Pharma-Quickstep. It was an incredibly convincing argument for just how fast this bike is. By the way, check out the paint scheme on those bikes. We think we need one for the AG garage! But as usual, we are getting ahead of ourselves. Let’s recap on the Norcom Straight. The Norcom Straight was built with a single guiding philosophy – build a TT bike for the everyday rider. Or as Fuji put it, “Fit Comes First.” Fuji’s belief being that a rider will be fastest on a properly fit bike. To achieve this “fit-ability” (Ok, we know that’s not a real word), Fuji went out of their way to offer multiple fit options on a single frame size. The stem comes in six lengths (80mm, 90mm, 100mm, 110mm, 120mm, and 130mm), as well as two rise options (±8° and ±17°), which allows for a total of 24 possible stem positions. The stem accepts a standard 31.8 mm bar. 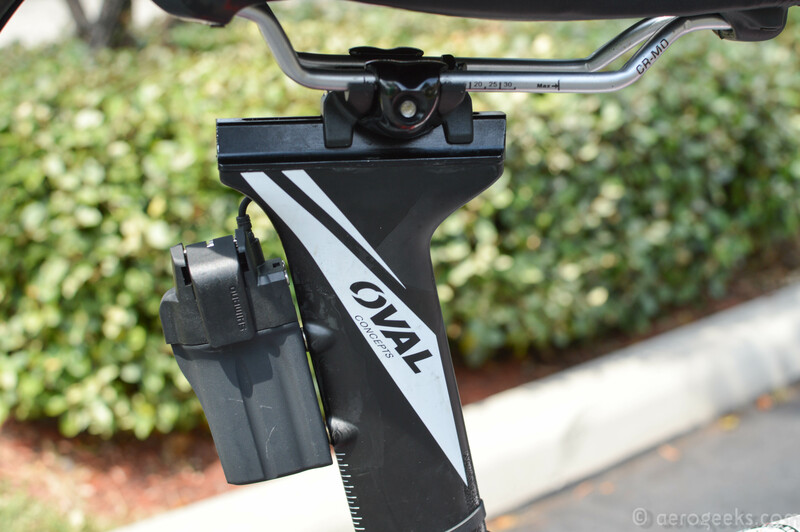 The included Oval Concepts bar has three arm rest width mounting positions, four riser heights, and five arm rest rotations—providing for 60 possible rider positions. The seat post has an adjustment range of 180mm in height and 70mm of fore/aft saddle adjustment, allowing for an effective seat tube angle from 74° to 81°. One of our favorite features of the Norcom was the adjustable rear dropouts. Anyone who has owned a bike with horizontal dropouts knows the pain and frustration of removing the rear wheel. Yet the benefit (allowing you to tuck the rear wheel as close to the seat tube as possible) make them almost worth it. The adjustable dropouts of the Norcom offer a best of both worlds solution – enabling you to tuck the wheel in close and tight while still providing the ease of a rear dropout. 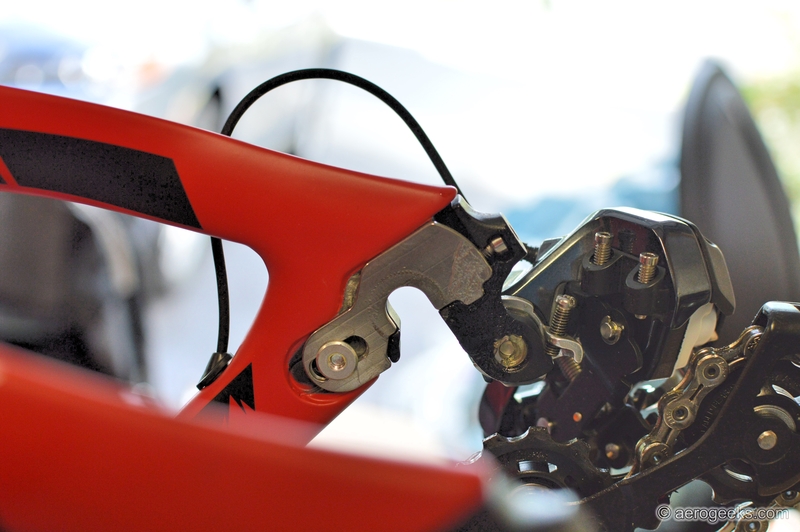 The Norcom also features a unique method of routing the front brake cable. The head tube features a small cutout for running the cable through to the front brake hidden behind the fork. Speaking of brakes, these were simply fantastic—quite possibly one of the strongest we have experienced on a TT bike. The majority of Norcom Straight builds feature the Oval Concepts 950 bar. If we had to name a major issue with this bike, it was this bar–specifically the pads. They provided almost no lateral support. 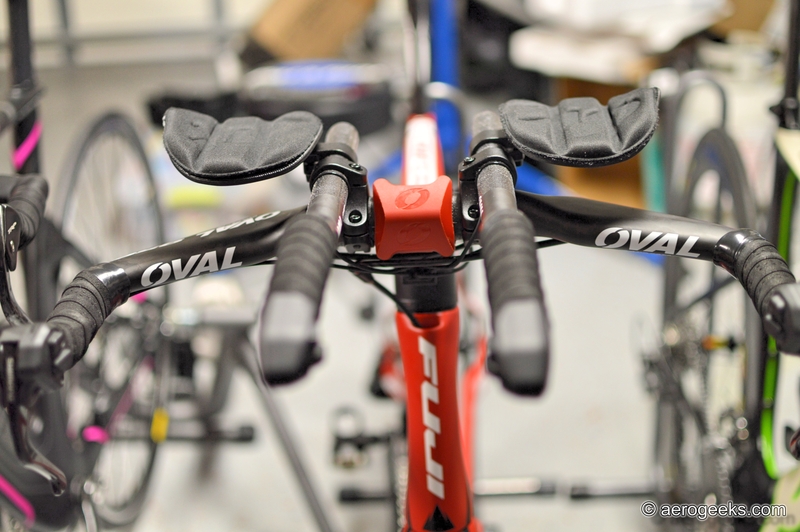 While we do not often modify a test bike (besides swapping in our own preferred saddle) we were forced to swap for a Profile Design F-35 arm rest kit. Additionally, the bar had very little internal wire integration. While there are ways to clean this up (and not end up with the wired mess we encountered) we would have preferred a cleaner solution from the get-go. If you decide to buy a Norcom, this is one additional purchase we would recommend considering. When we started discussing a review of the Norcom Straight, we specifically asked for the 1.3. 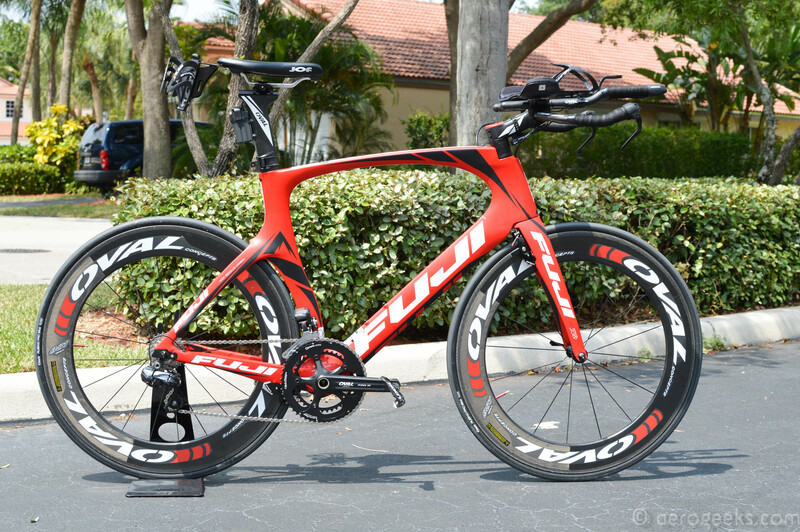 Based on the specs, we felt that while not exactly “cheap” (for 2014 it was $6,399, but keep reading for the 2015 price), this bike’s price point was at the lower end of the price scale while still being what we’d consider truly race ready. Built with Ultegra Di2 and 81mm carbon clinchers, it’s a bike you can easily take right from the showroom floor to transition. After spending the past few months with it, we can say that race ready is a perfect description. Between the ease of fit and speed, we were incredibly impressed. The Norcom is stable at low and high speeds. While not as agile as some other TT bikes we have ridden, it never left us wanting. We thought the bike’s the tall head tube (164mm on a size XL) was worth mentioning since, at first, it led to an exaggerated feeling of height from the ground. We really noticed it on our very first ride, but the feeling quickly disappeared from there—especially when you brought the bike up to full speed. Between the frame’s aerodynamics and the deep wheel set, this bike is fast. During its review period the Norcom held records on all of our primary Strava segments we use for testing. While there are no major spec changes for 2015, that doesn’t mean Fuji doesn’t have news to share. For 2015 Fuji has chosen to get aggressive in its pricing. The 1.3 that was $6,399 in 2014 is now just $5,399 for 2015. It’s still built with Ultegra Di2 and 81mm wheels, but it sadly lost the matte red paint scheme we’d fallen in love with. This is the reason why we do long term reviews–impressions based on specs alone never tell us the whole story. The Norcom is so much more than an easy-to-fit TT frame. Instead, it was one of the fastest bikes we have ever had at AG headquarters. What’s more, the 1.3 at its new $5,399 price point is incredibly well positioned for those looking to move up to a race-ready bike with the minimum amount of extra equipment needed. Fit may have come first, but we think Fuji has created a complete package. Thanks for the review. I have a 1.3 and I agree it is very fast. Did you use the AL Profile Design pad kit or the Carbon? We were using the J4 bracket kit with the AL pads. The pads alone would not fit. Any chance you tried out a Torhans VR on this bike while you had it? Unfortunately no. 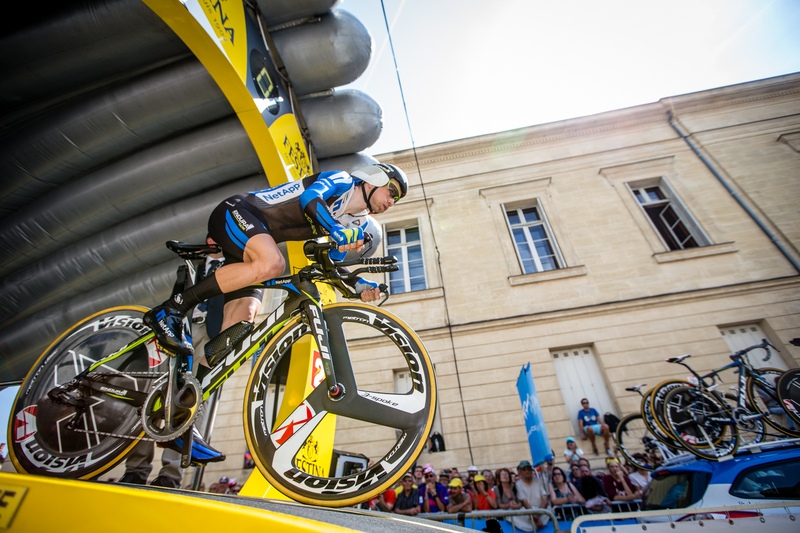 We were using the Zipp BTA with XLAB rear hydration setups. Did you use the full carbon wheels for the few months of testing, or swap them out for an aluminium set? Did you ride much with the original arm rests? I’m hugely tempted by one of these especially with the discounts going around on them at the mo, but the cockpit really seems to let the bike down with the arm rest design striking me as borderline unsafe. The lower specced models seemed particularly prone to the arm rests folding down with very little force, does the 950 bar have the same issue? That combined with the lack of support could make for a pretty nasty crash that simply wouldn’t be an issue on a properly supported set of arm rests. We did almost all of our rides with the Profile Design bars attached. However if the bars are your only concern and the deals are good, just throwing on a new set of bars should be an easy solution. I just got the 2.5 Seb and you’re right, the arm rests do slip, but thankfully they are all aluminum brackets and mounts so it just needed a stronger torqueing to hold it down more securely, I’m a mechanic so the tools for me were redily availabe when I did it, but it just takes a ratchet and a hex head socket or a long 5mm hex key to do it with better ease. If anyone just to happens to have a torque wrench on them with metric measurements, I torqued my arm rests down to 100 cm/kgs of torque whereas the install manual says to torque it down only to 50cm/kgs. Hope this helps anyone considering this bike. Honestly it was the only flaw with it, other than that, I’ve only been getting faster and more efficient miles on it. Second that – slightly flawed armrest design that is remedied by extra tension on the bolts, but otherwise, a great bike. a) DO NOT use the outer-most position where the most leverage exists towards moving them under weight. b) Tighten beyond torque specs. a) Make a new position for the armrests whereas they are more directly over the clamp – further reducing leverage that would cause movement. This is also a MORE aero position.